Mike Hamersky, a self-described New York Knicks superfan and season ticket holder from Astoria, claims that team owner James Dolan got in his face last night outside Madison Square Garden and screamed mean things. Asked about the allegations, Dolan tells Deadspin: Hell, yeah, I did! Hamersky, a 35-year-old attorney, says he was drinking a beer while waiting for his buddy, Raul Silva, to finish a cigarette before the Knicks/Bulls tipoff when he noticed Dolan walking past him to a waiting limo. “I couldn’t believe it was him,” he says. Hamersky says he grew up with Knick paraphernalia dominating his bedroom, and that he still collects autographs of the team’s stars to showcase in his office. But he says that for years he’s been as peeved as the next Knicks fan about the direction of the team, and didn’t want to waste a chance to speak truth to power. “Sell the team, Jim!” Hamersky shouted. According to Hamersky, Silva, and Dolan, the team owner, rather than getting in the car, turned around and walked toward them, asking who yelled. Hamersky admitted/boasted it was him, and Dolan got in his face and started yelling. Dolan asked Mike Hamersky what he did for a living, and Hamersky told him he’s a lawyer. “I think he was surprised to hear that,” Hamersky says. Hamersky says Dolan then accused him of being intoxicated, and the owner instructed his security detail to make sure that he not be allowed in the building. “He had an open bottle of beer and smelled of alcohol, and I told him he wasn’t going in,” Dolan tells me. Dolan adds that his friend and Eagles manager Irving Azoff, who was accompanying the owner during the fracas, agreed that the heckler reeked of booze. Hamersky denies being intoxicated, saying that he’d come to the Garden straight from instructing a Fordham law class, and wouldn’t have had time to get drunk before the game even if the spirit was willing. “I didn’t smell of alcohol,” he says. Hamersky says that at that point he walked away from Dolan because he was worried that the encounter would get out of control, and also that he’d miss the game. He says a member of Dolan’s security followed him away from the Garden for several blocks. (“All the way to 30th and 7th!” he says. “Then I lost them.”) He caught up with Silva on another side of the Garden and both entered the building and got to their seats without further difficulty. They admit they spent the game looking over their shoulders, expecting to be accosted. “I told Mike, ‘Man, you’re going to get Oakleyed!’” Silva says. Former Knicks forward Charles Oakley, of course, was removed by Garden security in February after allegedly yelling anti-Dolan sentiments before a game. After that incident, Dolan insinuated booze played a part in the ejection, going on ESPN radio to say Oakley “may have a problem with alcohol.” The episode only burnished Oakley’s legendary status among Knicks followers, and further damaged Dolan’s relationship with the fan base. In response to that emailed plea for a sale, Dolan had also suggested the pleader had a drinking problem (“Alcoholic maybe?”) and referenced his own battle with the bottle—“I just celebrated my 21 year anniversary of sobriety,” he wrote—which he has been very open about for years. Hamersky also says he intends to renew his season tickets for next year. 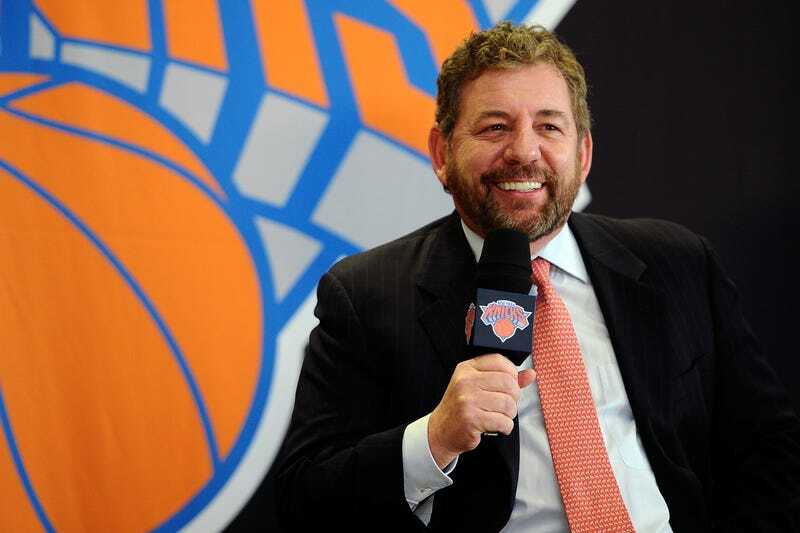 Dolan: "Start Rooting For The Nets Because The Knicks Don&apos;t Want You"